A commercial rooftop HVAC unit for cooling or heating a building, can offer considerable advantages over your typical heating or cooling system. The main difference between a rooftop unit, and a traditional HVAC system, is in the packaging. Traditional units are packaged as two separate sets of components, one set for indoors and one set for outdoors. A commercial rooftop HVAC unit, on the other hand, is comprised of just one set of components that will all be conveniently located on the roof. A practical and convenient set up is just one advantage of the commercial rooftop HVAC unit. Let’s take a look of some of the other pluses. There are many attractive advantages to choosing a rooftop HVAC unit. One of the greatest advantages of the rooftop HVAC unit is the remarkable performance and efficiency they offer. 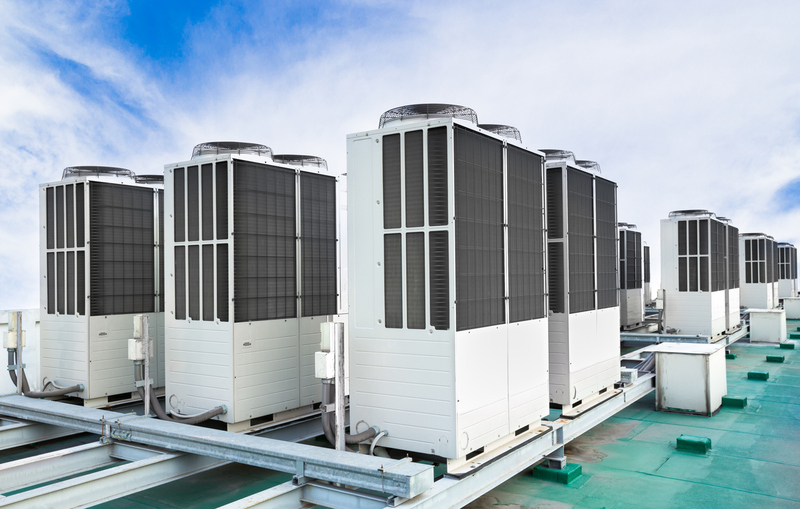 Commercial rooftop HVAC units offer more control options for controlling temperature and overall function, which is an ideal method for limiting wasted energy. Rooftop HVAC units also tend to have better SEER ratings. SEER is what is known as the “Seasonal Energy Efficiency Ratio”. This ratio is based on the output of the HVAC unit, divided by the energy it consumed over that period. Another rating that rooftop HVAC units tend to excel in are AFUE ratings. These ratings measure “Annual Fuel Utilization Efficiency”. Commercial HVAC units require a lot of power. They are usually responsible for heating or cooling entire buildings, so they have to be robust and durable. Unfortunately, this also means they are going to be very noisy. Placing an HVAC unit on the roof takes care of this problem. By removing the unit from earshot from the entrances and windows of the building, you are essentially getting rid of a lot of potentially disruptive and distracting noise. Commercial HVAC units tend to be quite large. They have to be, to provide enough power to heat or cool the area they need to cover. All this equipment out on the front lawn, or next to your building, as well as inside, is unsightly and unnecessary. Hiding it all away on the roof solves this problem, with a commercial rooftop HVAC unit. Rooftop units will also stay cleaner, as they will have less exposure to dirt and debris. Rooftop HVAC units typically have more ventilation controls, allowing you to control humidity and things of that nature. This helps keep the air in the building clean and fresh. Routine maintenance will be required for any HVAC unit to keep it running smoothly and effectively. Commercial rooftop HVAC units will provide easy access for any HVAC professional, as all components are in one convenient area. Because rooftop units are more energy efficient, they will require less maintenance. Commercial HVAC units are expensive. Keeping them safe from damage is crucial for avoiding needless repair costs. A rooftop unit is much more secure because it is out reach of vandals, thieves, and unintentional damage caused by accidents. The amount of space you will save is another huge plus for the commercial rooftop HVAC unit. For most businesses, free space is at a premium. Since all the components of the rooftop unit are out of the way on the roof, it frees up more room for extra workspace, storage, or whatever you may need it for. For questions of concern you may have about commercial rooftop HVAC units, you can contact the experts at Air In Motion. Air In Motion is a professional HVAC company operating around the GTA to take of all your heating and cooling needs.